The Onyx Webb series follows the unusual life of Onyx Webb along with a central group of characters in various locations and times. The billionaire Mulvaney family, piano prodigy Juniper Cole and her brother Quinn, paranormal show hosts Cryer and Fudge, and a few others make up the core of the series. Written like a book version of a supernatural soap opera, each character’s story moves forward with most every episode. It may appear that the characters are entirely unrelated and yet episode by episode, the connections will become clearer. Like being an inch away from a spider web, with each book, the web will move further and further away revealing the full story of every character and most importantly, the stunning conclusion for Onyx Webb herself. 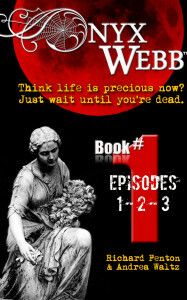 “There’s only one problem with the book Onyx Webb – it was over too soon. When I finished the last word, I was ready for the next book, but it’s not out yet – bummer for me and all the other readers who enjoyed this story! The authors’ writing style is descriptive and visual, which makes the story flow well, and the characters are interesting and well developed. The author does a good job of capturing the essence of each time period so that the reader knows where and more importantly when the characters are living. The story so far covers the 1900s, 1970s and 2000s, so there are marked differences in most aspects of the characters’ lives. Even with the different years represented it’s not confusing for the reader, possibly because each character is so distinct, which lets the reader identify character with time period. While this is billed as a ghost story, it’s more than that since the characters are so interesting, and I think this will appeal to a wider reading audience than just ghost story lovers or mystery lovers. 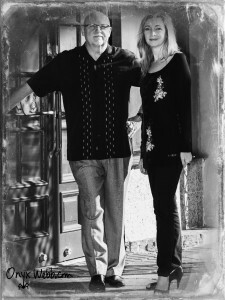 Richard Fenton & Andrea Waltz are best known as the authors of the #1 Amazon Sales & Selling book, Go for No! They are professional speakers who travel internationally speaking to audiences about how to overcome fear of failure and rejection. Although they have written several business books over the last fifteen years, Onyx Webb is their first fictional series. They are married and manage to write to together while staying happily married, a fact they are very proud of. Richard and Andrea live in Central Florida along with their cat, Courage. Because Onyx Webb is a long running series (10 total books, 3 episodes per book) we have spent hundreds of hours on organizing the content we need for creating this series. We’ve created and re-created (with changes) massive wall charts to visually map out the various characters and their stories. Plus it helps us determine how much time we have to tell a particular story. Since Onyx Webb is very much like a real web, there intersecting relationships and a variety of timelines which are critical to get right. For a year in advance of writing we bullet pointed the stories through all ten books for over 40 characters even the ones who only show up for a while. Then finally, for a single book we put post it notes all along the wall, breaking down each of the 3 episodes into around 15 scenes and getting clarity on what happens in each scene. Once we have the scenes basically identified in terms of what needs to happen, then the writing begins! The dog offered a tiny snort then jumped off the bed and ran toward the closed door. And directly through it. The fact that Dane’s childhood dog had just run through a solid object didn’t faze him in the least. He was used to such things growing up in Lily Dale. Richard takes the lead of writing all of the first drafts. His favorite thing – the quirk – is to wake up (no alarm needed) around 3 am and write from about 3 to 6 every morning, nicely uninterrupted. 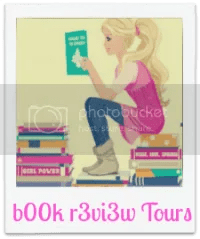 The goal of all authors, we both believe, is to share some kind of message (ours is about living life) and also creating a superb experience for the reader. For us, there is no greater compliment than, “I could not put it down.” Because if we can create that much emotional connection – we’ve done our jobs. We want to have people totally immersed into the world of Onyx Webb. Stonehenge is on our bucket list. We’ve almost gone twice. One time we were in London but the timing was just not good and it was winter so it was very cold. The second time, we bought tickets for an all day tour and Richard ended up coming down with food poisoning. We were literally on the tour bus weaving through the streets of London and let’s just say we got off the bus just in time. Richard was sick in our hotel room for the next 2 days. We are really counting on the third being the charm. Book One is a fantastic read on its own but as we are now writing Book Three, we are so excited to have people learn what happens next. Things don’t go off the rails in a supernatural way (not yet) but the betrayal, revenge, love, hate, goodness and evil that befall our characters should have our readers on edge for every page. 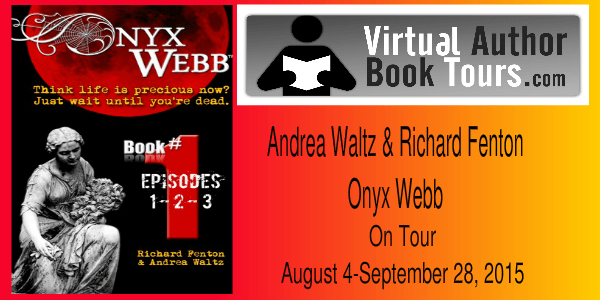 Thanks for your support of other authors and writing by hosting our Onyx Webb tour, Elizabeth, we appreciate it! Look forward to staying connected. I enjoyed book 1 and just ordered book 2. It’s a very interesting series. Good luck with the remaining episodes! Thanks so much for taking part in the tour and hoting Andrea and Richard!